The above info came from James Tan, and was edited by yours truly (contact me). The image came from 焼きたて!!ジャぱん. 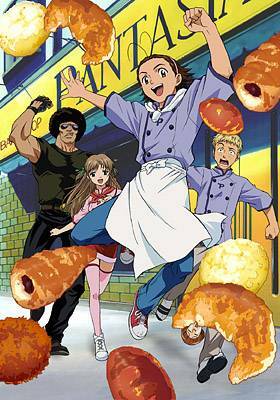 Azuma Kazuma plans on showing his bread creation; "Ja-pan" to the people of the Pantasia store. Which, he got his influence by watching a baker when he was about 6 years old. He also has those "Solar Hands". Azuma Kazuma's palms are said to be more warmer then those of regular people. He goes to compete against other people (some may be his own comrades), and along the way he meets up with people that'll support him as well, such as Kawachi Kyosuke, Tsukino Azusagawa, and manager of the southern Pantasia store, Ken Matsushiro. The above description came from James Tan, and was edited by yours truly (contact me).